As one of the nation’s largest and most prominent groups dedicated to facilitating public interest law fellowships, Equal Justice Works was already a successful and effective organization. But it needed to more proactively define itself. The Fellows were doing great work, but staff and board members struggled to describe the organization clearly and succinctly. Various potential funders tugged the organization in different directions, here incentivizing the organization to present itself as a direct service provider, there as an advocate for a given cause. Law students who were considering applying for fellowships weren’t sure what differentiated this organization from its peers. The results of this confusion were becoming burdensome. Communication products were taking a long time to generate without standard language to draw on. Development communications weren’t always benefitting from program communications and vice versa. Reaching internal decisions was time-consuming. 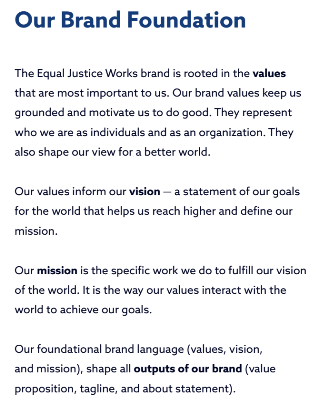 Equal Justice Works needed a vision, a mission, and a whole brand language system everyone could agree on internally and everyone could understand externally. In partnership with our visual design partners at Teal Media, we conducted extensive research to learn how people inside, outside, and all around the organization viewed Equal Justice Works. Together we conducted focus groups with donors, board members, and Fellows. We gathered quantifiable data from a survey, and conducted a day-long workshop with key staff where we also explained the purposes of various elements of the language system. All this research certainly helped find, isolate, and amplify the brand’s core. But, combined with great internal focus on the task from the client’s project lead, the research process itself also served as an internal validator. Leadership and staff were the people who most needed to embrace the eventual brand language system in order for it to be successful, and the research process helped them all get on the same page. We worked with the client to articulate the set of brand values that formed the foundation for the whole language system directly out of the research findings. The research findings also led directly to other key insights, such as the high credibility that Fellows held in the eyes of just about every audience. 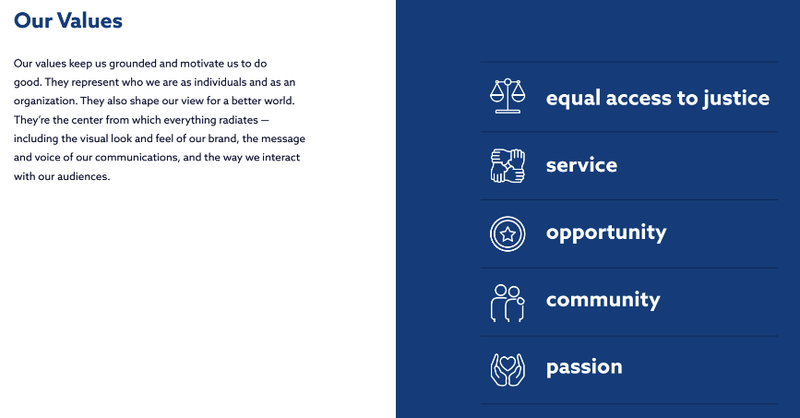 Based on the brand values, we then drafted a vision statement to spell out the organization’s goals for the world. The mission statement put the vision statement into action, and all the other language elements (value proposition, tagline, About statement, voice and tone, dos and don’ts, and key audience guidance) flowed in turn from this core of values, vision, and mission. Especially important for this particular client was the section of the brand guide devoted to how to utilize the program Fellows as ambassadors for the brand. Part of the reason the Fellows seemed to have such credibility was the way they embodied the brand’s values and helped point to answers to potentially divisive questions about the role of individual causes. Explicit guidance on how to tell Fellows’ stories and how to make use of this most valuable brand asset was a major focus. And the level of analysis and the quality of the execution of the project helped give everyone involved, from staff to leadership to board members, confidence that following the guidelines would produce the best results for the organization. That means more consistent usage of the brand language, and ultimately that means a louder voice for the organization with more stakeholders speaking as one.